It's no secret that print editorial, faced with a lot of entertaining competitors, is losing market. When the topic comes up, my suggestion for regaining momentum is simple. Offer something that no other medium can deliver as effectively: remarkable illustration paired with outstanding writing. Make it a product people really want to look at first, then seal the deal with compelling content. My concerns for print have mostly dwelled on a lack of foresight on the part of editorial management. Instead of more art, I see less. Instead of better content, it seems to get worse. Poignant art as a necessary ingredient for catching eyeballs, starting conversations and staying competitive and relevant in a changing world doesn't seem to have many buyers. Why is this the case? To me, it seems fairly simple. If you want to compete, do what you do best. It's easy to lay blame at the doormat of lack-luster and unimaginative management. They're a big target and easy to hit. But, there's plenty of blame to spread around. Imagine if some of it falls squarely at the feet of the illustration community, itself. I started imagining that recently and it wasn't a fun exercise. Anyone involved in the commercial illustration boom of the 1980's and 90's will fondly recall those salad days of cash and plenty. They were good times, but good times can breed complacency. The world of entertainment has changed dramatically, while you could argue that the basic assumptions about what illustration should deliver to an audience has stayed fundamentally the same. Illustration can still offer decoration, of course, but the demands for interpreting hard editorial content with skill and insight should be on the rise. I don't see that happening. Perhaps I'm expecting too much? I see more of the same salad day reruns. A good example of rising editorial standards is Forbes Magazine. Forbes, as anyone in the illustration racket knows, has been a long-time supporter of great illustration. They've used it well and in abundance. At the same time, Forbes has also consistently contributed hard-hitting and provocative editorial views. They remain a class act. The quality of journalism in Forbes has risen and in that regard they seem to be meeting the challenge of a new world. I look forward to it arriving. When Forbes exposes corporate corruption, poor practices and outright fraud, they often turn to the best illustrators in the business to help them tell the story. Their instincts are right. Illustrations should be able to aid this type of important content. As I was doing a casual browse through the last year in print for Forbes however, I was disappointed in the art. I didn't find even one example where the art came close to hitting as hard as the content. It was an unsettling realization for me. I say this knowing full-well that I am referring to the hard work of esteemed colleagues that I both know and admire. So, I'm a cruel SOB. I will loose friends. I don't care. Here's an example of where I'm at, and I'm using an illustration that I personally thought was one of the best that Forbes commissioned this year. In the October 30, 2006 issue, Forbes took a brutal look inside Emgen, a biotech sector business that supplies life-saving and vitally needed medications for cancer patients. Forbes pulled no punches - they exposed a corporate climate that is genuinely creepy and quite likely corrupt. The article stuck with me for weeks and it started a lot of conversations for me. Forbes commissioned Matt Mahurin for a full page to accompany the remarkable story. Mahurin, as many will agree, is a long time professional and well regarded for good reasons. His illustration solution? 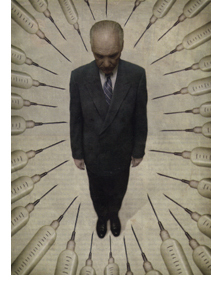 A bunch of needles, wonderfully executed, pointing accusingly at the CEO of Emgen. It had every single element that I would normally enjoy: High concept, arresting composition, limited palette and very well executed in a unique voice. It had everything. Yet, for some reason I wasn't satisfied in the same way that I used to be satisfied. I wanted more. The article itself was a huge conversation starter for Forbes. Why couldn't the illustration do exactly the same? Am I expecting too much? I hope I am not expecting too much. I'm a consumer. I just want a better product than the one that satisfied me in the 1990's. If they're smart (and I think they are) Forbes is asking themselves how the art they commission is doing anything more than decorating their pages at this point. I think it's important for illustrators to have that same conversation, as well. The articles themselves often have enormous impact, they start important conversations and actually move markets. Why can't the illustration contribute to the same conversations? They should, but right now they don't. I put all this out there as a consumer only. I'm not a critic. I don't have a masters degree in anything. I don't ever want to sit on a panel of judges. Perhaps I'm just a crabby and unsatisfiable consumer that should be ignored. I can live with that. Editorial print will survive, I'm convinced. I also believe that illustrators need to be an important ingredient for survival and growth. How that happens, I'm not sure. With that said, I honestly detest people who raise concerns without having a viable way forward. A wonderfully thoughtful essay Bob. It echos a lot of thoughts I've had also. I used to work a lot for Forbes but haven't for some time now. I know what you mean by the Mahurin picture. I hope soon that magazines can get their guts back. Meanwhile, I guess we'll all have to try, as you say, to generate self created works that will do the job and see if we can convince them to buy them. I came to this realization this morning before reading your post. Most of you guys are good at that self-generated work....something I've never really tried...but it looks like it would be the way to light the path toward the editors seeing the power of the graphic image. After re-reading your piece, I realize that you didn't mention self generated work....I guess it was on my mind and I mis-read part of your great piece. I think that if we become a little more independent and start doing some personal stuff the way others like Brodner do....maybe we can educate them back to graphic solutions. "It's no secret that print editorial, faced with a lot of entertaining competitors, is losing market" I wasn't aware of this, but if true it would explain a lot of things: the reduction of thought-provoking conceptual illustration, for one, and more "branding" in illustrators' work. John DeCesare, the great, now-retired designer for Ciba/Geigy who used to hire top talents like Eugene Mihaesco and Brad Holland, and also ran the Illustrators Workshop series over the years with Alan Cober, said one thing that has always stuck with me: Illustration is how the reader knows at a glance how to tell the editorial from the advertising, which uses primarily photos. That used to be the case. Nowadays the difference between the two is lessening, creating more confusion in the reader over what's what. There's lots of photo-illustration in editorials, and more photography used for fiction (e.g., in The New Yorker) Is this an agenda? To confuse, and by confusing, sell more? Or just editors following what's trendy. For my part I don't see visual indicators of strong editorial voices in mainstream mags like I once did. Maybe I'm not looking hard enough? Or most editors just have less interest in saying something in their own true voice. This isn't complaining Zimm, it's advocacy. That's cool. Yesterday I was listening to a discussion about the death of newspapers on NPR. The three writers that moved form print to web reportage all disagreed with the show's premise but all asserted that to think things will stay the same is crazy. Great illustration that is thoughtfully promoted and put in front of young art directors as visual solutions will still be the way we float. All of the corporate theories of whether or not we are not a safe choice for advertisers is out of our control. We can grind our teeth into nubs fretting over our plight but the best thing we can to is be aggressive and energetic and get our stuff out there. Many of us teach and have positions as chairs of illustration departments. We should be getting young illustrators and art directors to understand the value of illustration and teach them how to use it. I am always advocating for my school's graphic arts department to work with the illustration department for a period of time to teach each-other about the process. Brave art directors use illustration, not only in this country but around the world. Stefan Kiefer at Der Spiegel cam to NYC last year with his editor and chief in front of their collection of illustration from the last 50 years. The editor's view of illustration? It's the preferred choice on his covers. It's their brand. Anyway, thoughtful topic Zimm. I see the glass half full. Zimm et al: Great post Zimm and I have started and stopped a bunch of posts in other related threads because there are so many facets to these discussions. I will write about the point you brought up which I call the 'Pussification of America'. In my mind it is a cyclical thing. Right now, our culture and society does not want to see images that are reminicent of Marshall Arisman. Maybe because of the disturbing issues on and after 9/11? Maybe governmentally placed fear? Maybe over-political correctness? There is a complacency but I think it has more to do with the general U.S. culture than illustrators per se. To use an overused term, follow the money. Following the money, in our global economy, competition is at an all-time high. Each individual 'client' or reader is considered important. Rather than ignoring respectfully the 2-3 negative letters that would arrive that would be negative toward an image, entire policies change in fear of losing those few readers. That thread of thought leads into political correctness issues which I am not going to get into but I am sure everyone is aware of. I feel we as illustrators partially help create visual culture, but also, as image makers that illustrate the written word, are tied to the editorial powers-that-be. Whatever is going on in our culture is what we have to illustrate. That is limiting out of the bag. I could only imagine what writers have to go through. I will not offer a solution because I don't really think there is one. I will say, for me is that I try not to worry about it. Illustration content and styles fluctuate decade to decade (what ever happened to montages?) based upon the mood and 'personality' of our culture and society. Right now we are in our 'decorative politically correct' era with many trendy illustrators doing decorative stuff. This is the flavor of the decade. And yes, Zimm, the 90's for me was amazing also. Lots 'o cash and not too much editing. A full page illustration depicting a black (African American) husband shooting his wife then killing himself after he gave his son to a Jewish couple to watch. The husband didn't feel he was good enough to support his family. Baltimore Jewish Times. Would anything like that even be written let alone an illustrated full page? Maybe not. Don't worry, I think it will change. It'll change when the culture and our society will have enough of this politically correct, religious right and not be afraid to express one's self again and not be in fear of our government...or when our government stops making Americans afraid. (Did you see I think the Post headline today? New TERROR alert?) Sheesh. No wonder people are constipated. Will print die. No. Maybe I am right, or wrong about all this, I dunno...I am just thinking here. These are things I think of everytime I have to water down an illo because it may cause too much controversy. My recent post for that boating magazine is an example of that. I also don't think that illustrators are necessarily to blame or can do a heck of a lot about the 'pussification' of America. Ride this wave...there'll be a bigger one coming. There always is...you may need to shift your board slightly, or go to a different beach, but it'll come. Respectfully, Scott I hope this makes sense and offers my insight because I am not home typing remotely and not really editing myself. Apologies. Ah Zimm ,well put well written,and good observations.The maket dictates and we are heading for a lower and lower common denominator and image glut overload.But we have not seen the half of it, hand helds are almost here providing real time use of web , movies , text messaging and photos all in our hands,what was a magazine? Sudents come to class with play station 1,2, I Pods, digital cameras,and cell phones,music is playing through head phones ,as photos are beinging viewed on their cell phones,a tearsheet of Wilson Mclean on the wall does not move them very much. But I still beleive in the power of art ,and importance of art,so I push for the development of the artist ,whatever medium,and the pursit of the journey that your art may take you and the voice that you may find along theway .As doors close others will open ,we will all need to feed this enormous entertainment field as it grows in leaps and pounds,(story boards,animation,viedo games,graphic novels) Given all that however I still perfer to live on Surf Beach a paraell world where all the women are beautifull and of Chinese decent,the hotrods are very cool and the people are friendly,and they recycle. Comments much appreciated. Like a lot of articles posted in blog form, the point is often lost. Most likely, this can be attributed to a couple of things. One is that people tend to read into something what they personally would like to see, and two is that I'm not much of a writer. That said, here's a clear-up on a couple of points. First-off, poignant and compelling art doesn't mean violent, depressing or angry imagery. I'm not all of a sudden missing my Arisman's and Coe's, even though I admire their work. I'm missing something a bit less tangible. I'm missing excitement and reasons to talk about what I'm seeing. I think print editorial might be feeling the same way. I sense that it's time for the illustration community to start talking about the product without looking for forces to blame that are uncontrollable, such as the mood of the country or the inexperience of young editors. And, I do not buy into the argument that advertising dollars effect what a magazine will or will not put into print. The market will follow quality, which is usually surrounded by the most eyeballs. It's dangerous and unproductive to think there are forces which work against quality. Rather than competing in a race to the bottom, which I sadly sense that many feel the industry is involved in, I see it quite differently. I see a sudden lack of racers to the top, which previously fueled two great decades of innovation. And, I'm only speaking of print editorial, and how illustration should be pushing the envelope to help that medium when it attempts to tell worthwhile stories in a quality manner. I don't see that happening right now. When looking around for reasons why, I don't think it's productive right now to point anywhere but at the mirror first. Zimm, This series of articles is strong and hits the mark on most of the points. All of this background stuff is complex. But, what I keep telling people is, that, the way to remain viable as a collective, or as individuals, is to innovate and move forward. Too many illustrators find a "style", stay with it, and in 10 years time people just lose interest in it. I think trying new ideas and directions is what will keep A.D.'s and magazine readers interested.